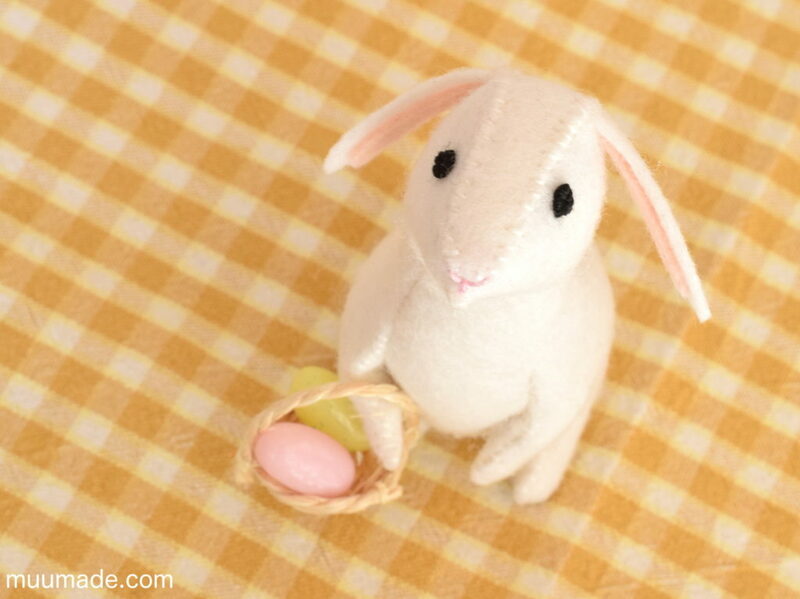 A Little Felt Rabbit is a sewing pattern & tutorial to make a furry friend of your very own. The finished rabbit is 13.5 cm (5 3/8″) tall with upright ears and 11 cm (4 1/2″) tall with floppy ears. 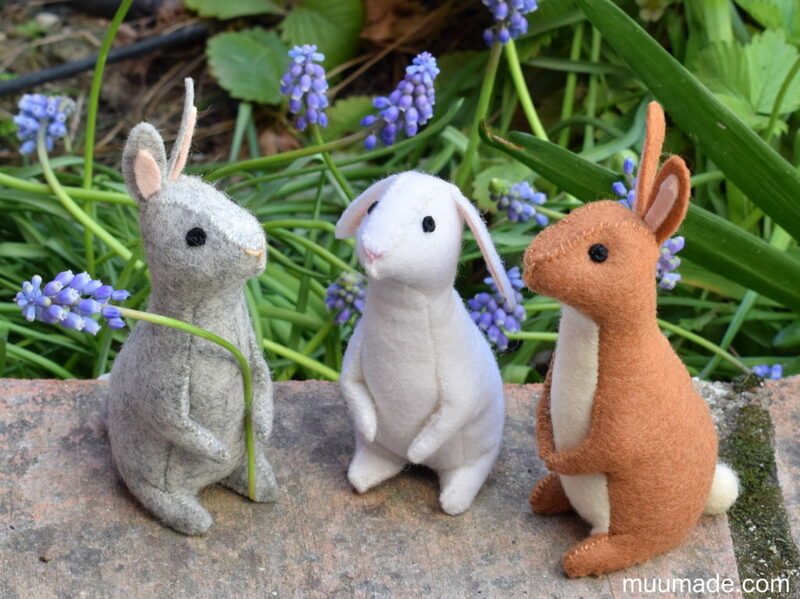 Although I already have two other bunny patterns in the Muumade collection, A Little Felt Bunny (the blue floppy eared bunny in the above image) and a Bunny/Hare finger puppet (the hare with the #1 bib in the above image), I wanted to design a rabbit that was sitting up on its hind legs. 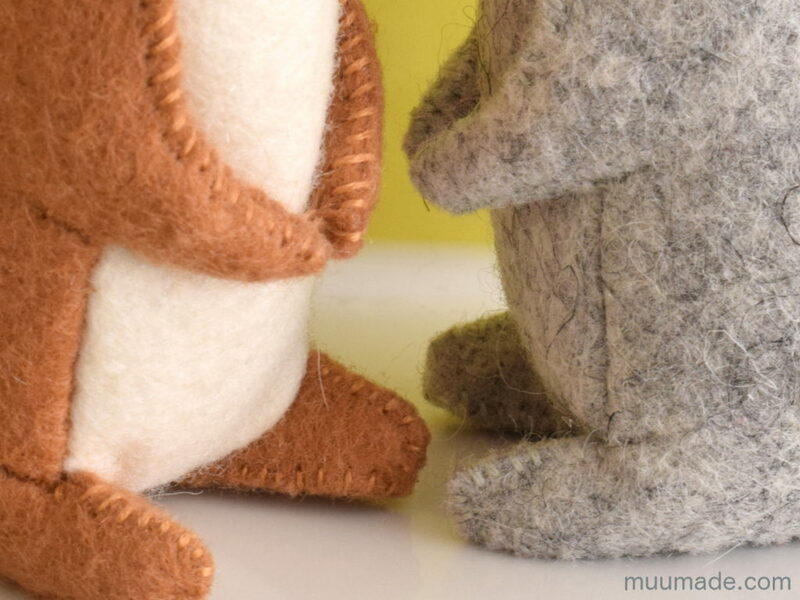 When I was designing the Little Felt Rabbit, I observed that bunnies have impressively large hind legs and feet. But I did not realize how strong they were until I read that a rabbit can leap as far as 2.7 m (9 feet) horizontally, and jump over 0.6 m (2 feet) and in some cases up to 1.2 m (4 feet) high. No wonder their hind feet and legs are gigantic in proportion to the size of their body! Since Bunnies are such an iconic symbol of Easter, I included instructions to make a basket to accompany the Little Felt Rabbit. The basket is small, but it is big enough to hold two jelly beans or a number of small pompoms! The Little Felt Rabbit sewing pattern & tutorial is a download item, which is available from my online shop, muumade.etsy.com. You can click on any of the links or photos above to go to the item page and download the instructions instantly upon purchase. 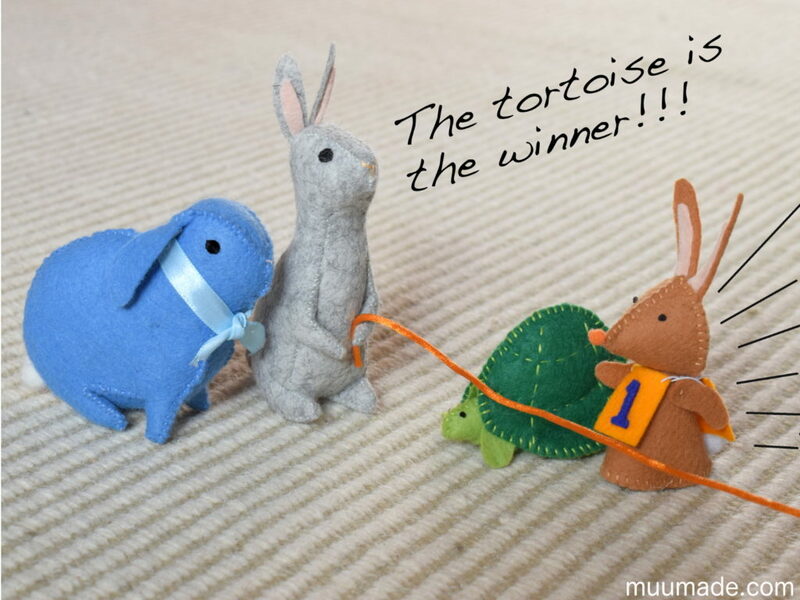 If you like the Little Felt Rabbit, you may also be interested in other Little Felt Animals. Hurray for the impressive hopper!